Not every night, but on occasion Stan would take an evening drive up and down Frost Valley, checking that the buildings and properties of the 3,000 acre estate were as they should be. One late dusk he ask if I’d like to come along. I hopped in the the blue Scout’s shotgun seat and we headed up the valley. As we were passing the meadow where I had seen the baby skunk a flicker of light caught my peripheral vision. My mind quickly processed it to be the headlights of the Scout glancing off a discarded metal can next to the road. Just as quickly the idea was dismissed — reflected light could not have come from that angle. Rather alarmed, Stan slammed on the breaks as I opened the door and was jumping out as the Scout stopped. Without hesitation I was running across the meadow, my arms outstretched in joy, ignorant of where I stepped. My heart races to this day remembering my anticipation of arriving on the far side of the meadow, nearest the fishing hole, where they were the thickest. Once there I could only twirl and twirl in exaltation — they were so beautiful and so silent and so mystical and joyful and unpredictable. They were just so present in the warm gathering darkness. I was raised in the West. We have no fireflies. I had seen Disney’s Song Of The South and had figured the animated dances of randomly glowing lights in the background landscapes were as real as Sugar Plum Fairies. 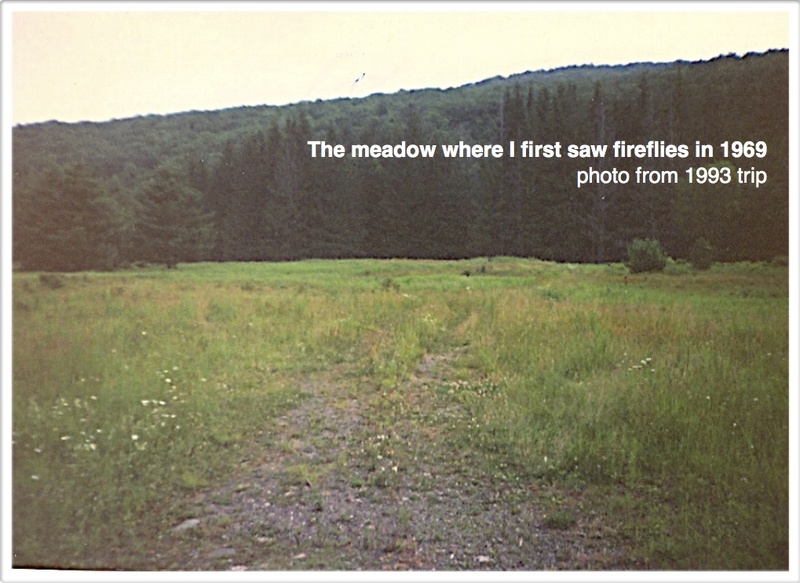 When you are twenty-two years old and see actual fireflies for the first time, thick like they were in that meadow, they are one of the most elating experiences you can imagine. Magic. Lighted life, adding dimension to the night with soft glows ramping brighter and dimmer, on and off, floating randomly over and through the tall grasses. It took me a while to calm down. My twirling slowed. My shouts of glee and Oh My God and Look! Look! Look! quieted. I caught my breath. Lowered my arms. Stood and soaked in the moment and the meadow and the magical insects. Finally I walked back to the Scout. This entry was posted in Hitchhiking and tagged fireflies, Frost Valley, New York State, Stan on May 13, 2014 by deansgreatwahoo.